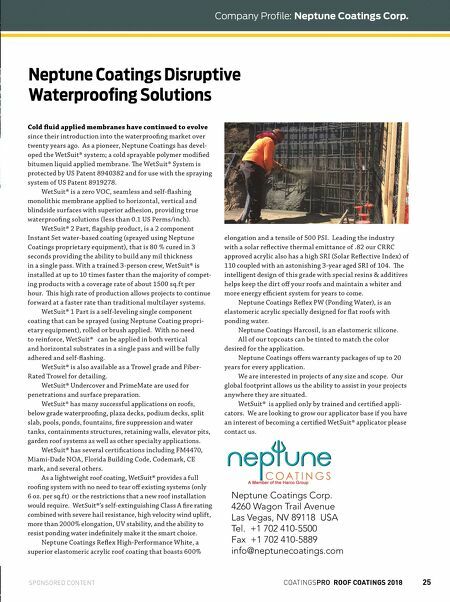 COATINGSPRO ROOF COATINGS 2018 25 SPONSORED CONTENT Neptune Coatings Disruptive Waterproofi ng Solutions Cold fl uid applied membranes have continued to evolve since their introduction into the waterproofi ng market over twenty years ago. 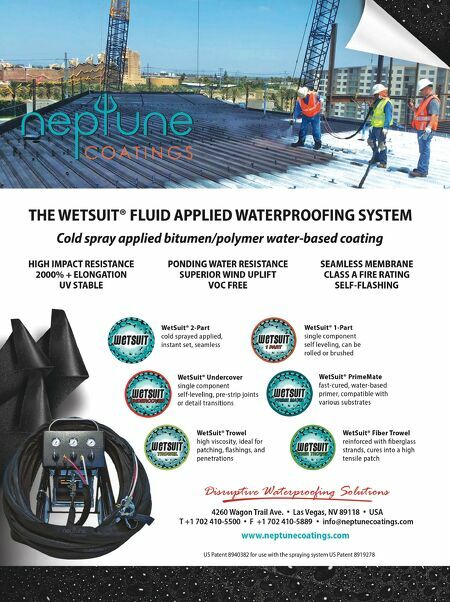 As a pioneer, Neptune Coatings has devel- oped the WetSuit® system; a cold sprayable polymer modifi ed bitumen liquid applied membrane. e WetSuit® System is protected by US Patent 8940382 and for use with the spraying system of US Patent 8919278. WetSuit® is a zero VOC, seamless and self-fl ashing monolithic membrane applied to horizontal, vertical and blindside surfaces with superior adhesion, providing true waterproofi ng solutions (less than 0.1 US Perms/inch). WetSuit® 2 Part, fl agship product, is a 2 component Instant Set water-based coating (sprayed using Neptune Coatings proprietary equipment), that is 80 % cured in 3 seconds providing the ability to build any mil thickness in a single pass. With a trained 3-person crew, WetSuit® is installed at up to 10 times faster than the majority of compet- ing products with a coverage rate of about 1500 sq.ft per hour. is high rate of production allows projects to continue forward at a faster rate than traditional multilayer systems. WetSuit® 1 Part is a self-leveling single component coating that can be sprayed (using Neptune Coating propri- etary equipment), rolled or brush applied. With no need to reinforce, WetSuit® can be applied in both vertical and horizontal substrates in a single pass and will be fully adhered and self-fl ashing. WetSuit® is also available as a Trowel grade and Fiber- Rated Trowel for detailing. WetSuit® Undercover and PrimeMate are used for penetrations and surface preparation. WetSuit® has many successful applications on roofs, below grade waterproofi ng, plaza decks, podium decks, split slab, pools, ponds, fountains, fi re suppression and water tanks, containments structures, retaining walls, elevator pits, garden roof systems as well as other specialty applications. WetSuit® has several certifi cations including FM4470, Miami-Dade NOA, Florida Building Code, Codemark, CE mark, and several others. As a lightweight roof coating, WetSuit® provides a full roofi ng system with no need to tear off existing systems (only 6 oz. per sq.ft) or the restrictions that a new roof installation would require. WetSuit®'s self-extinguishing Class A fi re rating combined with severe hail resistance, high velocity wind uplift, more than 2000% elongation, UV stability, and the ability to resist ponding water indefi nitely make it the smart choice. Neptune Coatings Refl ex High-Performance W hite, a superior elastomeric acrylic roof coating that boasts 600% elongation and a tensile of 500 PSI. Leading the industry with a solar refl ective thermal emittance of .82 our CRRC approved acrylic also has a high SRI (Solar Refl ective Index) of 110 coupled with an astonishing 3-year aged SRI of 104. e intelligent design of this grade with special resins & additives helps keep the dirt off your roofs and maintain a whiter and more energy effi cient system for years to come. Neptune Coatings Refl ex PW (Ponding Water), is an elastomeric acrylic specially designed for fl at roofs with ponding water. Neptune Coatings Harcosil, is an elastomeric silicone. A ll of our topcoats can be tinted to match the color desired for the application. Neptune Coatings off ers warranty packages of up to 20 years for every application. We are interested in projects of any size and scope. Our global footprint allows us the ability to assist in your projects anywhere they are situated. WetSuit® is applied only by trained and certifi ed appli- cators. We are looking to grow our applicator base if you have an interest of becoming a certifi ed WetSuit® applicator please contact us. Neptune Coatings Corp. 4260 Wagon Trail Avenue Las Vegas, NV 89118 USA Tel. +1 702 410-5500 Fax +1 702 410-5889 info@neptunecoatings.com Company Profile: Neptune Coatings Corp.